I've had this idea for a little while now, to write up the 'rules' of death metal. One of these rules might very well be "Any band with the words "Worm" in the name is guaranteed to be awesome". Worms Eat Her seem to prove this sentiment with their new three song EP, known only as WEH-EP02 (Which, for the uninitiated basically means its the second Worms Eat Her EP) See, Worms Eat Her get at brutality in a simply primitive way. They eviscerate children with their guitars, their growls are filled with hate, and the primeval evil here is simply something you don't want to mess around with. 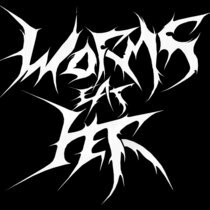 Worms Eat Her are filled with an appetite for destruction, and their is no stopping these French men. Their stripped down and violent approach to death metal is a lot of fun to listen too and reveals the sort of bare bones blackness that we all love so much. There are no frills here, barely even any production, Worms Eat Her are going to tear your hair off and knee you in the face, so jump on in the pit and let your body shake!